ounty of south central England. Oxford was the chief stronghold of the Royalists during the Civil War (1642-46), and was the scene of many battles. There are several prehistoric remains in Oxfordshire, including the Rollright stones, and the Devil's Quoits. There are also several Roman villas, such as North Leigh. 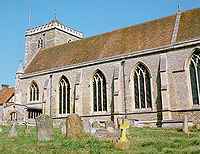 Few old monastic buildings or castles remain, the most important being the abbey church at Dorchester-on-Thames, and the castles at Shirburn and Broughton, near Banbury. There are remains of famous houses at Greys Court, Minster Lovell, and Rycote. Churches of note include those in Oxford itself, and those at Adderbury, Iffley, and Minster Lovell.